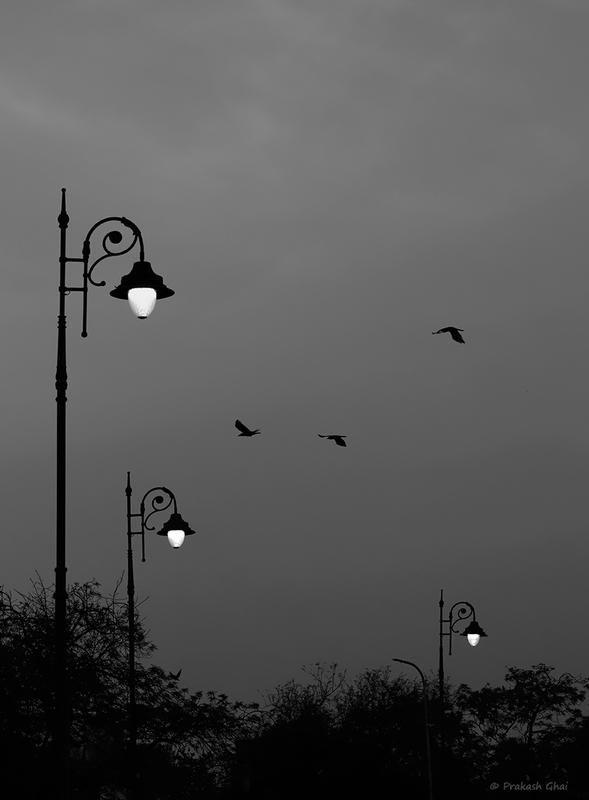 A Black and White Minimal Art Photograph of a Three Lamps and Three Birds, shot at a beautiful evening near Statue Circle, Jaipur. This was captured today evening, while I was on my way to Curious Life Cafe. I stopped at Statue Circle as I noticed that it was getting dark and the lights were just getting turned on. The lights attracted me and I stopped at the circle holding the camera in my hand, waiting for birds to enter my frame. Also, I kept some distance from the Street Lamps intentionally, as I wanted to show some distance in the frame, primarily in an attempt to make them look small. And, I kept the image on the darker side during editing as I wanted the lights to stand out. Hope you enjoyed the Three Lamps Three Birds Minimalist Photograph. 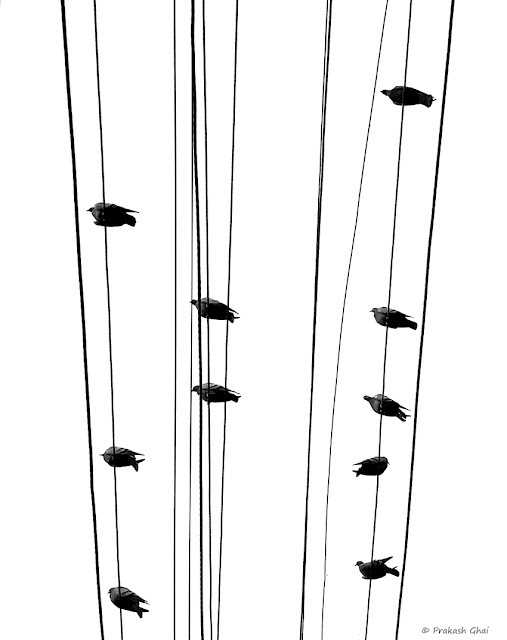 A Lookup Black and White Minimal Art Photograph of Birds Sitting on Electricity Wires, outside Bake Hut, at MI Road, Jaipur. Shot captured via SamsungS6 Mobile Phone Camera. This Shot was captured using my cellphone. I would barely post Cellphone shots on my blog, but since this photograph got a very good response on my facebook and twitter, I decided to post it here and also make it available for sale as a framed print. Some people on Facebook told me that this photograph resembles "Music Notes". It is alwasy interesting to hear about people's interpretation of photographs. I edited this picture in my Samsung Galaxy S6 Mobile Phone using the default editor. I also edited this a bit in the Snapseed Android App. This picture was captured in the Auto-Mode, but still it would be worthwhile to look at the EXIF Data break-up to understand what the phone's algorithm does. The aperture was F/9, the Shutter Speed 1/2000 and the ISO was 100. What I did manually here, was to reduce the Exposure. 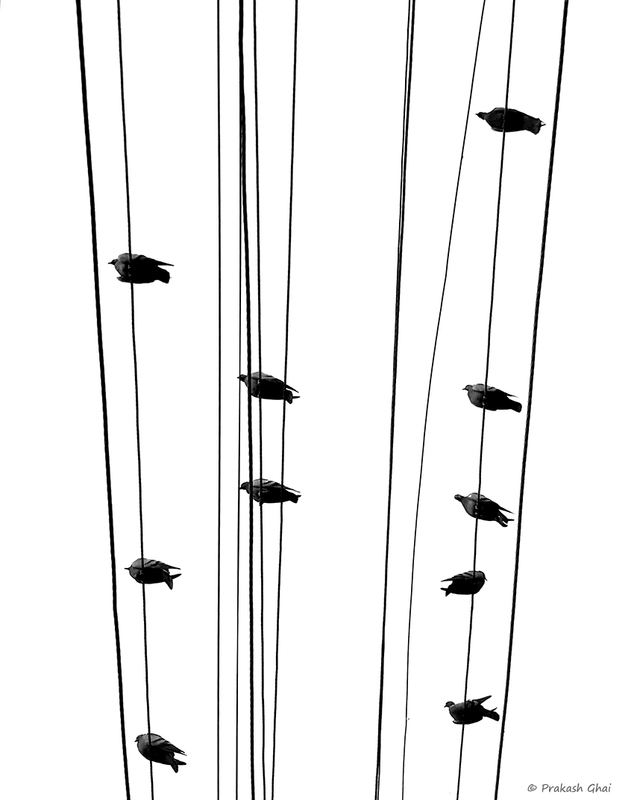 Hope you enjoyed the Birds on Wires Minimalist Photograph. A Black and White Look up Minimal Art Photograph of the Architecture at Jawahar Kala Kendra/ JKK Jaipur, shot with Canon EOS 6D Mark II full frame Camera. I Mostly do not shoot Minimalism at Wide-Angle, but this time I tried, and for once the results are pretty OK. I was on the 24-105 mm Lens and this frame was captured looking straight up, exactly at 24 mm. It was peak afternoon and what I liked here was Light and shadows, and the fact that I could make the frame look a bit symmetric. The elements were near perfect. Two Water outlets, one having a long shadow. Then some Lines and then a Rectangle right in the center. 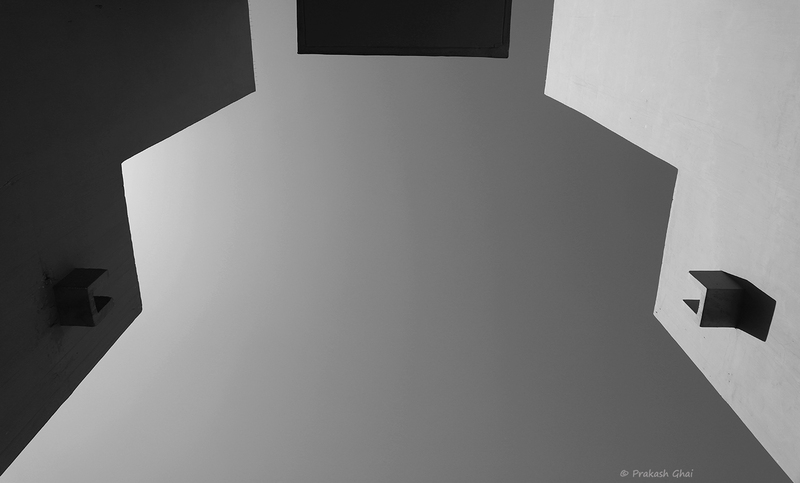 Hope you enjoyed the Lookup Minimalism at Jawahar Kala Kendra Minimalist Photograph. A Black and White Minimal Art Photograph of a Distant Lamp as seen through the metal fence at Masala Chowk, Jaipur, India. Shot Captured with Canon 6D Mark II Camera. How I composed this shot? I started by focusing on the Distant Lamp, then I looked for the right aperture value to shoot this shot at. 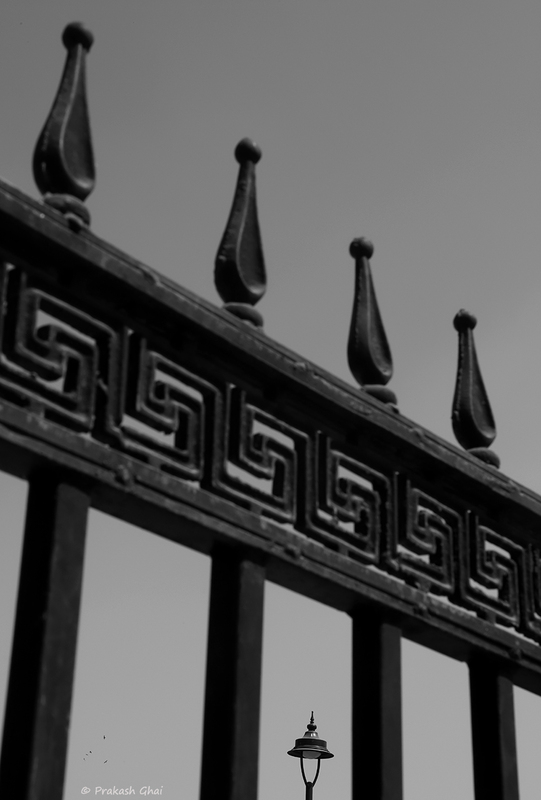 I did not want the fence in the foreground to appear blurry. Therefore, I shot this at a very high Aperture value of F/22. Since, I was shooting from the side and at an angle, this helped me to make the repeating fence bars create a kind of downward sloping diagonal line. That is pretty much all I want to say about the composition here. Also, have a look at the EXIF Data of the photo below. Hope you enjoyed the Lamp Through the Fence Minimalist Photograph. 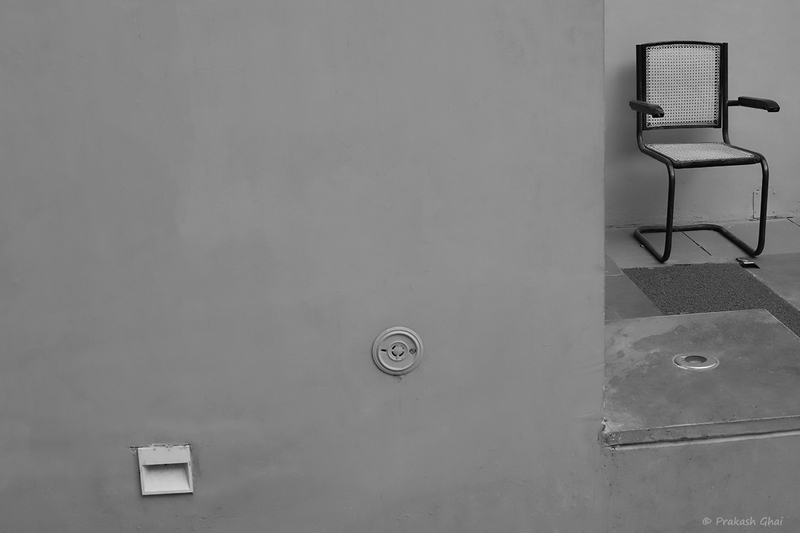 A Black and White Minimal Art Photograph of an Old Plastic Mesh Chair found at Jawahar Kala Kendra, Jaipur, India. This Shot was captured near Art Gallery 1 at JKK. A security guard usually sits at the chair right in front of its entrance gate. When I was shooting, the guard had gone for a stroll. As you can see in the shot, the wall has been used as foreground and that is the negative space here as well. To keep the wall and the elements on it in focus, I used a pretty high Aperture value i.e F/18. By keeping the wall in the foreground and by cornering the Old Plastic Mesh Chair, I visually increased the focus on it. Also, I captured the shot from a distance, so as to show the size of the chair relatively small. That is pretty much about the shot and the composition in a few words. If you have any queries about the picture, send me an email. I don't promise to answer back all of the mails but I will try my best. Hope you enjoyed the Old Plastic Mesh Chair Minimalist Photograph.